Tomorrow is Thanksgiving in the States and in a few hours millions of Americans will be sitting down to a traditional turkey dinner. 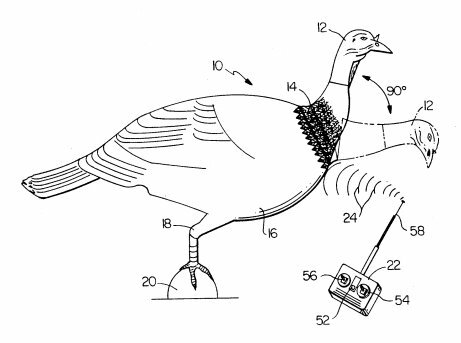 In honour of that noble and self-sacrificing bird, here are a few turkey-related patents. Of course, few people today actually hunt and kill their own turkey. But for those that do, there is this patented animated turkey decoy, US5289654, for luring reluctant gobblers into the open. If you prefer to have your bird and eat it too, there is this turkey trophy mounting kit, US5064725, for displaying the tail fan, beard and feet and an eye-catching “full strut” turkey plaque, USD566614. This attractive turkey figurine, USD314357, is the perfect center piece for any Thanksgiving table. And don’t forget to bast your turkey using this turkey-shaped baster, USD390070. This entry was posted in Thanksgiving, turkeys. Bookmark the permalink. Hello, I don’t usually read your blog, but you might want to correct a there/their/they’re error in this post.Love, Your grammatically hypersensitive wife.